Palate: Accessible but with real character of vanilla and sweet spice. Finish: Great length, medium sweet. Cask Combination: Sherry seasoned oak casks form a rich base, whilst American bourbon seasoned casks add a fresh complexity. There is a top dressing of hand picked, first fill, sherry oak hogshead casks. Testament to The Macallan’s knowledge and mastery of wood, Select Oak uses 3 cask types – American Oak seasoned with either sherry or bourbon and first-fill European oak casks seasoned with sherry. Investing more per cask than any other Single Malt, each Macallan cask has been handcrafted and selected under the supervision of The Macallan’s Master of Wood, George Espie. This very special whisky has a high proportion of first fill Sherry Oak casks. Jim Murray - Is this one of the great Macallan noses of all time? 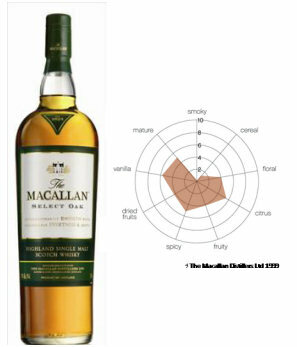 Without question….the ultimate Macallan for those looking for layering and texture, rather than sherry or simply effect: a malt unashamedly for whisky sophisticates, as well as those looking to get into Single Malt for the first time. Paul Pacult - First whiffs after the pour encounter delectable and well-defined spice and fruit/bakery notes. Entry is appealingly sweet, honeyed, and uncomplicated; midpalate displays a medium-full texture and plenty of winey/sherried sweetness that carries through well into the finish, which is medium-long, peppery, and agile.